212 East, the University of Illinois’ newest, design-centric, pedestrian-oriented student housing community is now open for Fall 2017 and moving in residents. 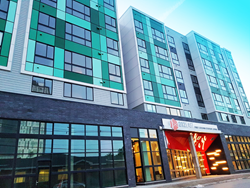 XFD Real Estate Partners partnered with Lewis & Clark Real Estate, a St. Louis-based real estate investment firm, to develop the contemporary student community which completed construction in July 2017. 212 East is a six-story mixed-use community with 11,000 square feet of retail space at street level, and an array of amenities designed to create an environment that propels academic success, physical fitness, relaxation, and a pronounced sense of community. The 428-bed community offers spacious floor plans with an all-white modern-vintage aesthetic for the minimalist in all of us, Larson added. The apartments host high-end finishes such as quartz counter tops with waterfall edges, subway tile backsplashes, two refrigerators (for three and four bedrooms), floor-to-ceiling windows, and up to five TVs per apartment. Utilities are included with the exception of electricity and cable TV. The community offers students a state-of- the-art fitness center (one of the largest near UIUC), private and group study rooms with digital displays for presentations, as well as a coffee bar and lounge. The building also has a chic courtyard in its center, which makes for the perfect indoor/outdoor space, whether students just want to relax or entertain guests at one of the multiple grill or lounging areas. 212 East is located less than half a mile from the student union, in the heart of Campustown and its restaurants and nightlife, and is a short walk from grocery shopping and classrooms. For more information about 212 East and to schedule a tour, please visit http://www.firstcolumnliving.com/east-212 or in-person at 212 E. Green St.